Creating a reinforced corrugated structure to support the weight and mounting a premium print substrate to smooth out the surface, we balanced the aesthetics and the budget. The two-tiered bottle layout with contrast colored insert against the printed wood background and contoured header moved the entire presentation upscale, delivering on the cost and production timeline the project needed. 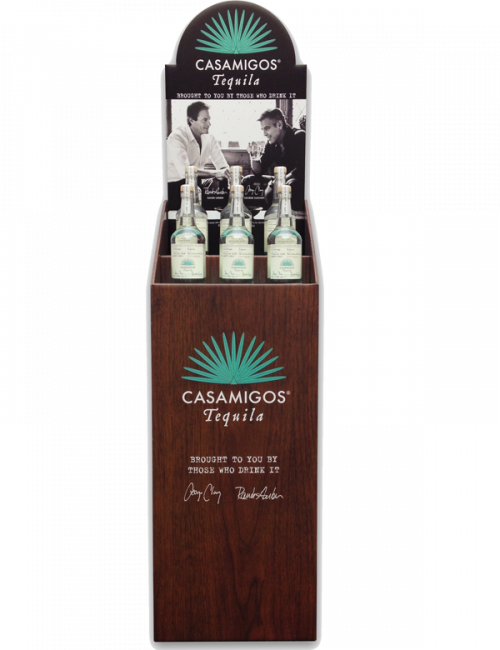 Actor George Clooney and spirits impresario Rande Gerber required a distinctive six-bottle case bin floor display to launch Casamigos, their premium new tequila. WE WANT WOOD was marketing’s directive for the brand image they needed but wood’s material/labor and shipping weight were cost prohibitive on a tight budget and the project had to be produced quickly. Creating a corrugated structure with heavier substrates to smooth out the surface and support the weight, we balanced the aesthetics and the budget. The two-tiered bottle layout with contrasting colored insert against the printed wood background and shaping the foam core header moved the moved the entire presentation upscale, delivering the budget and production timeline the project needed. Sales LOVED it, it’s just like WOOD. Like acting, clever merchandising can be an art of make believe.